Air guns and pellet guns are similar, however, they use different types of ammunition. Pellet guns, also known as BB guns use lead bullets of various sizes. Air guns use small plastic bullets. You may think that these are harmless, however, they use air pressure to shoot, which makes these bullets shoot at extreme rates of speed. The speed of the bullet can cause damage. Also, the plastic bullets come in just one size. If you need your firearm to shoot quietly for any reason, a silencer is the way to do it. There are a few reasons why you might want to consider putting a silencer on your gun. Safety: When an air rifle is shot, it can be very loud. If you shoot your rifle often, it can result in hearing loss. According to the National Institute on Deafness, 15 percent of Americans over the age of 20 can suffer from hearing loss due to shooting air rifles and other types of firearms. A silencer will protect your hearing. Fewer Disruptions: If you are target shooting in your yard, the noise from your air rifle can be very disruptive to the people in your home as well as your neighbors. A silencer will keep the people in the area from being disturbed. Effective Hunting: If you are using your air rifle to hunt, a silencer will prevent animals in the area from hearing your gun and getting scared off. Accuracy: When you shoot your air rifle and it makes a loud noise, it is not uncommon for you to recoil, which will make it difficult to hit your shot every time. Below is everything you need to know about noise suppression for your pellet gun. How Does An Air Gun Silencer Work? A silence screws on the end of the barrel of the gun, The silencer has a volume that is 20 to 30 times greater than that of the gun's barrel. When the silencer is in place, the pressurized gas that forces the bullet out has more space to expand. This causes the pressure of the hot gas to drop significantly. When the pressure drops, the noise from the shot is greatly reduced. Are Air Rifle Silencers Legal? The legality of air rifle silencers has been debated for years. If you want to purchase an air rifle silencer, you would need to request permission from the federal government. Under the constitution, you are allowed to own a firearm, however, this does not apply to gun silencers. Whether or not you get the permit for an air rifle silencer depends on the state that you live. If your state refuses, you have no legal recourse. There are currently about 36 states who often agree to air rifle silencer applications. To legally obtain one, you would need to fill out an ATF Form 4. You would also need to provide your local police station with your fingerprints, a photo ID, and $200. There are two questions on the form that need to be answered by your local law enforcement. If law enforcement refuses to answer the questions, your application would be denied and there is no process for appeal. If you commit a crime using your silenced air rifle, there would be additional penalties, even if you had permission to use the silencer. How Much Quieter Can I Expect My Air Rifle To Be? 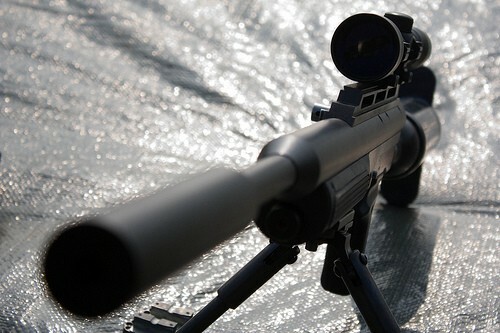 Many people believe that an air rifle silencer will make the rifle silent. This is not the case. There is always going to be some noise when the rifle is fired. Depending on the type of air rifle silencer that you buy, you can expect the shots to be one quarter to three quarters quieter. It is impossible to completely quiet a gun, however, a little quiet can go a long way. Before you make the decision to put a DIY silencer on your air rifle or pellet gun, you should understand that it won't be legal without a permit. As mentioned above, you need a permit to put a silencer on your gun. That being said, making a DIY silencer is easier than you might think. Start by getting a long piece of pipe that is between one and two feet long. It should also be large enough in diameter to fit over the front sights. When you fit the pipe over the front sights, you should check the angle. If it is at the wrong angle, it can keep the ammunition from exiting the gun the way that it should. If the pipe isn't staying on securely, you should use tape to secure it in place. When you load the ammunition into your gun, rather than hearing the typical pop sound, you will hear a low-pitched thump sound. To make your air rifle even quieter, you can line the inside of the pipe with steel wool. This will absorb even more of the sound. If you don't have the suppressor on straight or if the steel wool is uneven, the ammunition might hit the steel wool right through, making it useless. There are plenty of legal reasons why you might want noise supression for your pellet gun. If you are planning to buy a silencer, you are going to need to get a permit. If you choose to make your own, you can save money but you are taking a risk if you don't go through the necessary channels to make your silencer legal. If you are going to purchase a silencer or if you are going to make your own, each shot won't be silent, however, they will be greatly muffled.